The Drinket Collection was specifically designed to provide the best quality cups at the most affordable prices. Here at Prestee we believe quality in a service or product is not what you put into it, it is what the customer gets out of it. Our 9 oz. Clear Plastic Tumblers are the perfect size for serving a versatile range of drinks, at upscale events, receptions, bar side, or anywhere a conventional glass cup would be used. Rolled Rim for Easy Sipping. Convenient and Cost-Efficient alternative to traditional glassware. Reusable with a quick hand wash.
(200) 9oz Hard Plastic Cups. STACK-ABLE: These Old Fashioned Clear Cups are specifically designed to be stack-able. With a rolled rim and light weight construction, you can rest assure that these are perfect for any occasion. 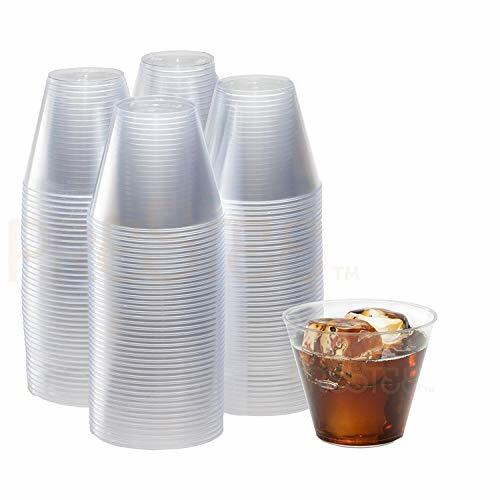 INCLUDED: - 200 - pack of small plastic cups. Each round plastic cup can hold up to 9 fluid ounces. DRINKET: Each party cup can hold various beverages including but not limited to: Wine, Champagne, Soda, Water, Juice, Beer, Liquor, Mixed Drinks, Punch and Teas. If you have any questions about this product by Prestee, contact us by completing and submitting the form below. If you are looking for a specif part number, please include it with your message.